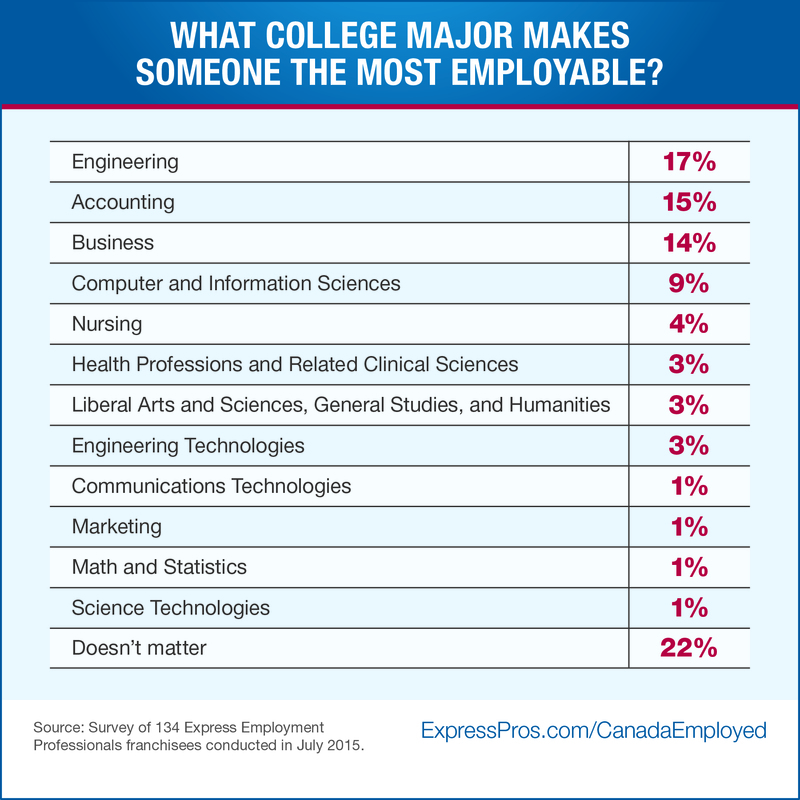 22% Say Major "Doesn't Matter"
TORONTO, ONTARIO--(Marketwired - Feb. 24, 2016) - Express Employment Professionals released new survey results today revealing the most employable university and college majors. The findings come from a survey of 134 Express franchisees across the nation. Respondents were asked, "Which university or college major makes someone the most employable?" Engineering was the most popular response at 17 per cent, followed by accounting (15 per cent), business (14 per cent) and computer and information services (nine per cent). No respondent chose education or finance. In a similar 2014 Express survey, business topped the list, followed by engineering. Not all respondents felt strongly about a single major, though. The most popular response, at 22 per cent, was "doesn't matter," indicating that they may place greater value on "soft skills" like work ethic, attitude, and accountability than on degrees and certifications alone. "We've often said there's a mismatch between the skills people have and the skills that employers are looking for, and this survey indicates which degrees confer the skills that are most in demand," said Bob Funk, CEO of Express. "While we always need a workforce with diverse educational backgrounds, university and college students would always be wise to consider which degrees will offer them the greatest chance of employment after graduation. Guidance counselors, parents, and educators would also be well advised to pay attention to the demands of the modern job market." The survey of 134 Express Employment Professionals franchisees was conducted in July 2015. If you would like to arrange for an interview with Bob Funk to discuss this topic, please contact Kellie Major at (613) 222-7488. Robert A. "Bob" Funk is chairman and chief executive officer of Express Employment Professionals. Headquartered in Oklahoma City, the international staffing company has franchises in the U.S., Canada and South Africa. Under his leadership, Express has put more than 5 million people to work worldwide. Funk served as the Chairman of the Federal Reserve Bank of Kansas City and was also the Chairman of the Conference of Chairmen of the Federal Reserve. Express Employment Professionals puts people to work. It generated $3.02 billion in sales and employed a record 500,002 people in 2015. Its long-term goal is to put a million people to work annually. Express launched in Canada in July 1996, with a franchise in London, Ontario, and since then, has expanded and grown across Canada significantly. There are currently 37 Express franchises in Canada - six in British Columbia, five in Alberta, two in Saskatchewan, 23 in Ontario and one in Nova Scotia.